Licorice Laces - 4 oz. Licorice Jelly Beans - 3.5 oz. Black Bites - 1/2 lb. Red Bites - 1/2 lb. 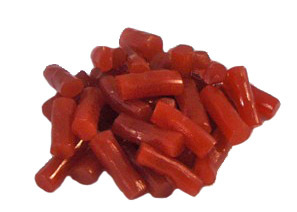 Strawberry Twizzlers - 1/2 lb. Licorice Pastels - 1/2 lb.